I think he would've been elected anyway. I mean, who are people going to vote for? Donald Trump? Same here, I thought he had probably already died naturally. BTW are you a model or something? Except Romney. Of course, Romney may not get the nomination because the Christianists dissaprove of his religion. Of course it will. He did something Bush couldn't. Kill Osama, apparantly. People aren't gonna see it that way. Obama's gotten rid of the enemy, it was in his time, therefore he's the hero. I think you'd be surprised, especially after that appalling speech he gave, where he pretended to be CEO of the operation. It was consistent with his view that everything is about him. He used the word "I" seven times and five times and five times he referred to the directing he did of the operation, yet he hardly mentioned the soldiers who carried out the mission. I'm sick of this man's ego. When Bush delivered his speech after saddam hussien's capture, it was 4 times shorter, he only used the word "I" three times. Once to thank the soldiers, once to congratulate them, and once to warn of future terrorism. That's what the rock said in his WWE birthday party on raw. I believe simply because of the events over the past week the second term is nailed in. That was a mistake; I mean to say another term. I guarantee he gets in again. His approval rate shot up ~10% but that will matter less ina year and half since unemployment would still be high. 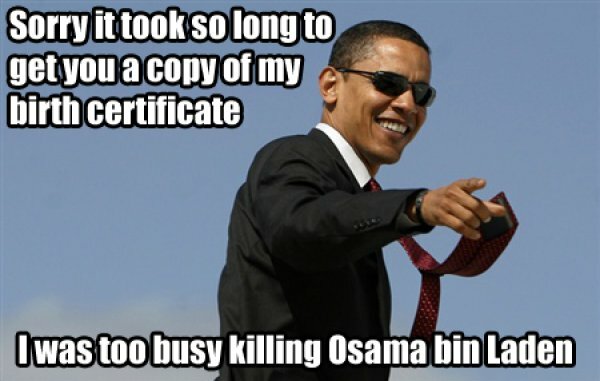 yes, i think the killing of mr bin laden will have gone down well. first they said bin laden resisted them + used his wife as a shield. then they admitted that bin laden didn't have a weapon but still offered resistance - what do they mean, that he intended to bite them? i suppose it's possible that they thought he might find a gun. they also admitted that bin laden had not used his wife as a shield, rather she had decided to charge the american attackers leading to them shooting her in the leg - interestingly her "resistance" did not necessitate her being killed. then the americans said that as osama was a "field commander" still actively involved in fighting america it was legitimate to kill him. and there stands the truth. he was killed because he was a son of a *****. and i agree that that is reason enough to shoot him.